On Thursday, 24th September, St Aiden’s N.S. was visited by members of the Defence Forces-Lieutenant Brian Daly and Corporal Mark Bennett both from Renmore Barracks. 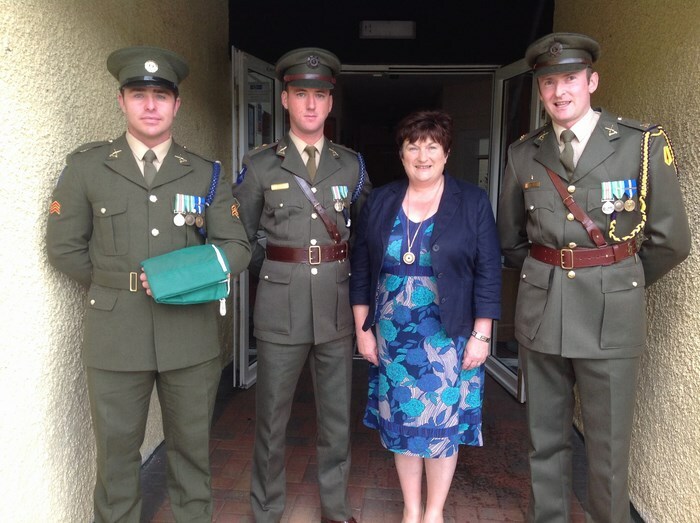 They were accompanied by Commandant Joe Freeley from the Athlone Barracks. Commandant Joe Freeley, a past pupil of this school, was a surprise guest. This visit is the first part of a National 1916 Commemoration Celebration. 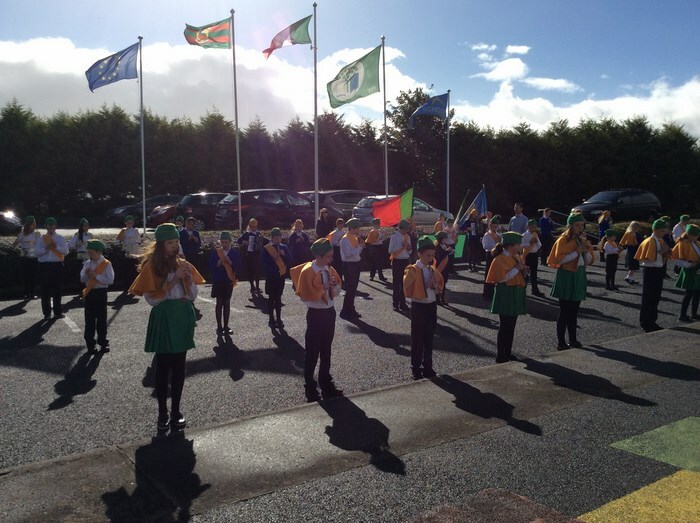 The officers were welcomed outside by Banna Cheoil Scoil Aodáin, who formed a guard of honour for the officers as they proceeded to the school hall. Mrs Cunnane formally welcomed everyone and Commandant Joe Freeley spoke on behalf of Óglaigh na hÉireann. 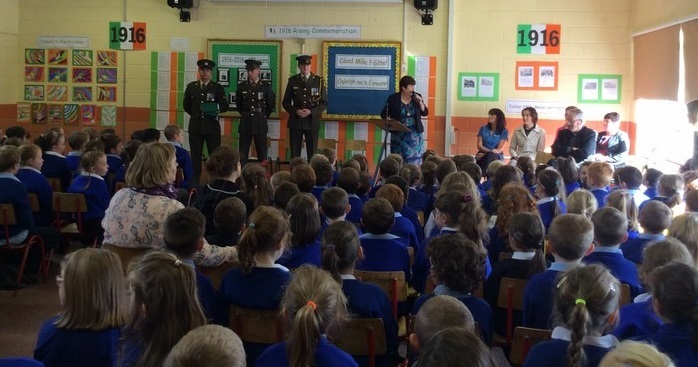 Lieutenant Brian Daly read out the 1916 Proclamation with two 6th Class pupils reading a pre-selected extract. Commandant Joe Freeley spoke to all the children on how the National Flag should be cared for and the protocol that surrounds this vibrant symbol of our nation. 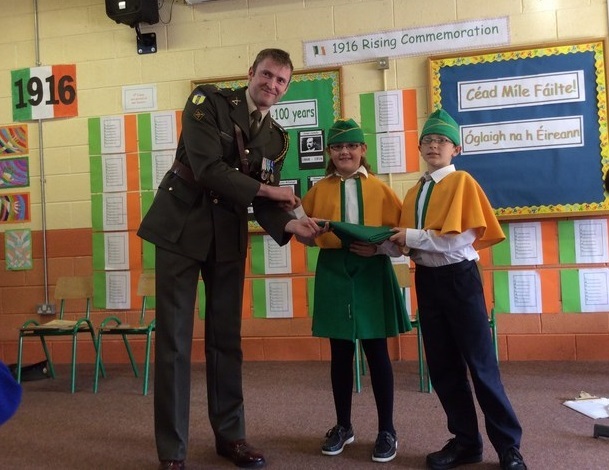 Commandant Joe Freeley then presented the flag to two pupils from 5th class and a copy of the 1916 Proclamation to Mrs Cunnane. A question and answer session followed with children from every class getting a chance to put questions to the officers. The ceremony concluded with our school choir singing the National Anthem under the direction of Miss Lee. We look forward to learning alot more about 1916 in this centenary year. All schools will raise the flag on the 15th March 2016 to mark the 100th anniversary of the 1916 Rising.